Mega murals make Truck-side’s atmosphere theme park cheery. Since opening Cheese Curds in 2012, Bill Pratt has proven himself talented at creating trendy fast-casual concepts with broad appeal. After opening Habaneros, which has flavours inspired by Mexican and Tex-Mex cuisine, last year Pratt opened Truck-side, a food court that features Lil Eatily Italian Pasta Bar, U-Pick-Fish Seafood Shack and Gweilo Asian Noodle Bar. I am going to say right out of the gate: I don't get the allure of a high-concept food court. And this concept is risible: It mimics the experience of eating at food trucks without all the—I guess?—bother of having to actually eat at a food truck. 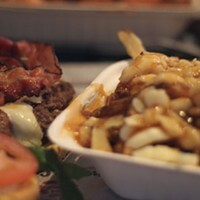 The charm of a food truck is almost entirely based on eating outdoors, walking away with something easily eaten on a bench or on the go, the sun shining warmly down on you, your hot dog and the jittery, beady-eyed starlings that are mentally preparing to scrap for scraps in whatever garbage can you eventually use. Without the outdoor element, there is literally no point to having a refurbished Purolator truck anywhere in sight. 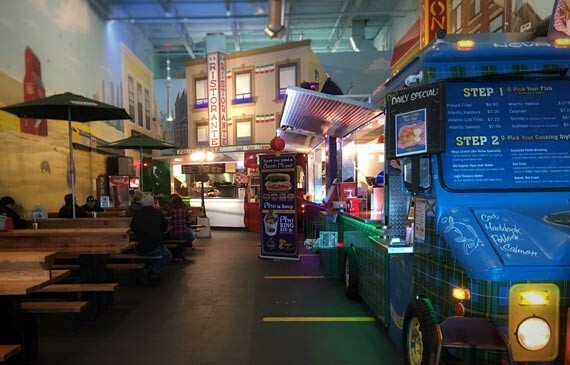 It's not like this is a new idea: In 2013, street food starting moving indoors, with places like Trinity Kitchen opening in Leeds, and the Los Angeles International Airport announcing the addition of restaurants serving out of shelled trucks. It seems like nothing but a way to capitalize on a trend, to make fast-casual food court dining feel funky and fresh. The decor at Truck-side is theme park cheery, with huge murals on the wall behind the shells of the trucks, the cityscape blending one concept into the next, creating a small world (after all). The space is anchored in the front by an impressive sculpture of a city bridge that spans the airy space above the entry. Things start to fall apart in other details, which include what someone apparently thinks is a hilarious joke about pronunciation above the Gweilo truck that stops just short of swapping Ls and Rs. The food, for the most part, is pretty good. It's expensive self-serve fare, though, at $15 to $20 a meal. The fish menu is somewhat DIY, with your choice of white fish, salmon or shellfish and batter—panko, tempura, beer batter, breading—then baked or fried. Then you add your choice of potato or rice, coleslaw and sauce. 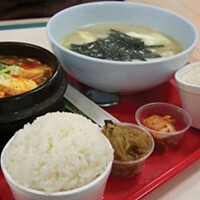 The Asian menu takes a cursory run through curry and teriyaki, lemongrass and kimchi, with stir-frys, noodles and soups. The Italian menu features a spate of pastas and pizza. The kimchi fried rice ($12) is pungent and fiery, with a dollop of cabbage kimchi in the honey-sweetened sriracha sauce, slabs of caramelized BBQ pork, and buttery pops of edamame, bright green onions, and cilantro that keep the dish interesting. It's a good bowl, made better by its proximity to a regrettable bowl of gnocchi ($9.95). Gluey dumplings, more pudding than pillowy, sit soggily in a bolognese that is, at once, deeply bland and oversweet. The fluffy foccacia garlic bread that came with the combo ($3) is the only passable part of the dish. The scallops ($9.95), lightly coated in flour and pan-fried in butter, are the best thing we eat, nicely seared and still slightly translucent in the middle. Crisp curly fries ($2.75) and a zippy tartar sauce (50 cents) do the job. The sheer volume of options and the colourful atmosphere make this incredibly family-friendly and I understand that allure, but I don't imagine I'll be back. Scotia Square Mall has a more affordable food court with fantastic Asian, Mediterranean and seafood options, and I'm saving my food truck dollars for Food Wolf, Fran's and snacking in the sunshine. This one just isn't for me. 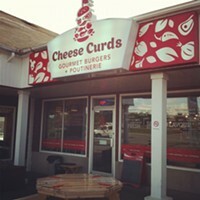 Cheese Curds Gourmet Burgers + Poutinerie soothes the savage beast with outstanding onion rings, tasty poutine and stellar service. 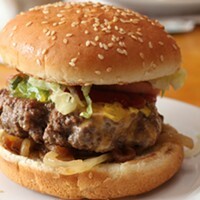 Melissa Buote combs the city’s burger joints for the ultimate in patty perfection.